ANAHEIM, CA -- Mike Trout took slight comfort in reaching a couple statistical milestones on the final day of the Los Angeles Angels' worst season of the 21st century. He's determined to make sure next October means a whole lot more. Trout stole his 30th base and drove in his 100th run, and the Angels wrapped up just their third losing season in 13 years with an 8-1 victory over the Houston Astros on Sunday. "I knew about them for sure, and it's always cool to get 30 stolen bases," Trout said. "It's not where we want to be, but it's good to end it on a positive note." Jhoulys Chacin pitched seven scoreless innings of four-hit ball for the Angels (74-88), who won nine of their final 11 games and still finished 12th in the 15-team AL. "We finished strong," said Trout, who completed his second 100-RBI season. "There's a lot of positive things we can take away from this year. It seemed like every other week, our lineup or our pitching staff took a big hit, but we played good for the last few weeks." Trout concluded another MVP-caliber campaign stuck on 29 homers, but he got his stolen base in the first inning and an RBI single in the sixth before leaving to a standing ovation. Trout went 1 for 2 and added two walks to his Angels-record total of 116, tops in the majors. "This guy is the MVP," Angels manager Mike Scioscia said. "I don't think there's any question." Los Angeles finished fourth in the AL West, failing to finish in the top three for the first time since 1999. The Astros (84-78) missed the postseason for the 10th time in 11 years, though they won only two fewer games than last season's playoff team. Houston's Brady Rodgers (0-1) gave up five hits and four runs in his first big league start for his hometown team. The 26-year-old farmhand, who made his MLB debut last month, relished the chance to face Trout. "It was pretty cool, a pretty special moment that I'll always remember," Rodgers said. "Hopefully we have a lot of battles in our future. I'm definitely looking forward to the competition between him and I." 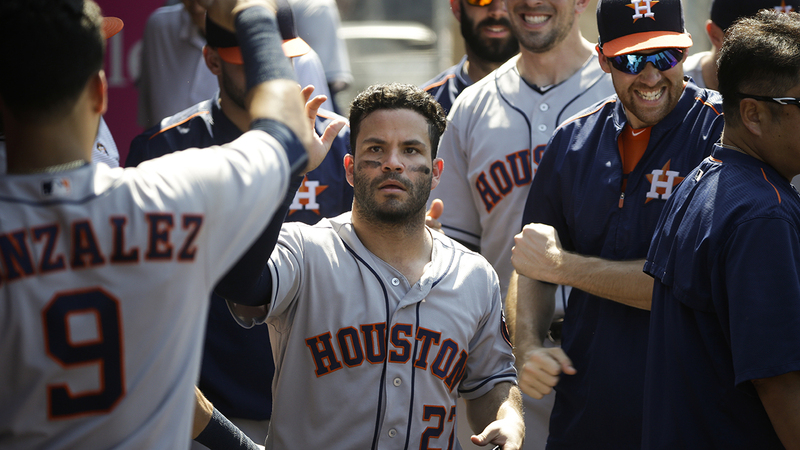 Jose Altuve went 1 for 4 with a broken-bat single in the ninth inning, ensuring his second AL batting title at .338. "It's nice for him to end on a high note," Houston manager A.J. Hinch said of Altuve. "The bat breaking is probably not his favorite. He loves his bats. But what a sensational season for him." Carlos Perez had a two-run double during the Angels' four-run second inning, Kole Calhoun added a two-run double in the sixth and Jefry Marte homered in the seventh. The Angels became the second team since 1913 to play an entire season without an extra-inning win. Only the 1969 Montreal Expos have done it in that stretch. Los Angeles played only four extra-inning games, the second-fewest since 1913 behind the 1936 St. Louis Browns (3). Chacin (4-4), a midseason acquisition, finished an inconsistent year with a dominant effort in his first victory since Aug. 21. He improved to 4-2 with a 3.37 ERA in his career at Angel Stadium. Before the game, the Angels announced home plate umpire Bob Davidson is retiring after 28 seasons. The 64-year-old Davidson saluted the stands during a warm ovation. Davidson, who broke into the majors in 1982, is perhaps best known for his aggressive balk calls. Astros: RF George Springer played in every game this season, although his finale was brief: He led off the game with a single and promptly left for a pinch-runner. He is the first Houston player to appear in every game since Carlos Lee in 2007. Springer led the majors with 744 plate appearances. Angels: RHP Jered Weaver took a curtain call when he was recognized on the scoreboard. Weaver, who skipped this start with back pain, is a free agent this winter who might not return to the Angels, his only big league team for 11 seasons. "Hopefully there's more," Scioscia said.